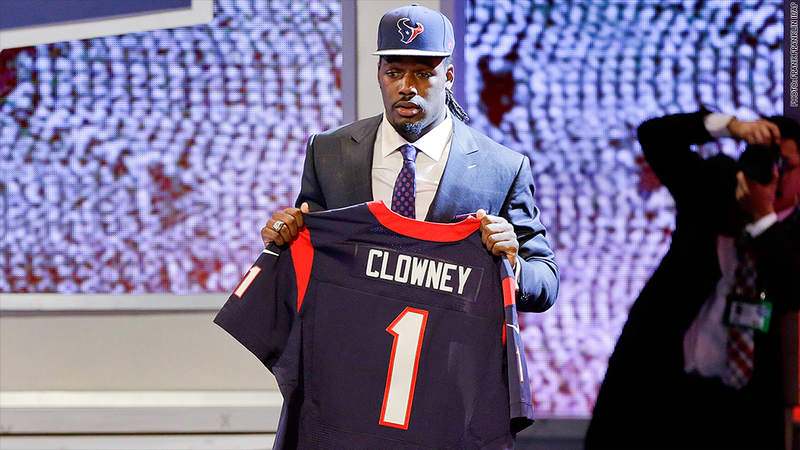 The Houston Texans took Jadeveon Clowney first in the NFL Draft. Ex-players hope he and other rookies manage their money wisely. Who wouldn't want to be Jadeveon Clowney? The NFL's top draft pick just landed around a $22 million contract with the Houston Texans and bragging rights for life. His face is everywhere, and his name is a trending Twitter hastag. But while Clowney -- and hundreds of other NFL rookies -- know a lot about football, they know little about managing money. Many are likely to end up bankrupt. Just two years after their athletic careers end, 78% of former NFL players are bankrupt or nearly there, according to an analysis by Sports Illustrated. "I've made millions and Iost millions," admits Eddie George, who was a first round draft pick in 1996 and went on to play nine seasons in the NFL as a running back. "I bought a ton of jewelry coming out, cars, a stereo system that was worth more than the car," George says. "I found out real quick that money and ignorance is not a good combination." He was once in a shop in Atlanta and was so excited they had gator shoes that fit his size 14 feet that he bought 20 pairs. He's pretty sure he never wore any of them. 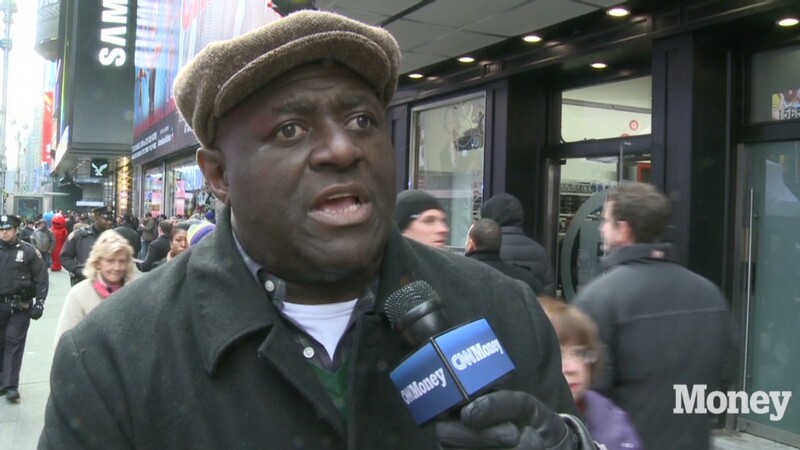 George, who has gone on to a successful acting and entrepreneurial career, advises young NFL players to live modestly and figure out what they need versus what they want. Maurice "Mo" Kelly has been a friend and mentor to many athletes over the years. He's senior director of player development for the Seattle Seahawks, a post that entails helping players with everything from getting a place to live to figuring out where and what to eat. He'll be one of the first people greeting the latest draftees when they land in Seattle. "A lot of these guys don't have any concept of money. I always ask the question: How many of you guys ever made over $10,000 a year in your life?" says Kelly. Usually no one raises their hand. He starts orientation by showing draftees a copy of their credit scores. "Honestly, I didn't know about credit until I got to the NFL. I had a scholarship in college and didn't have to worry about that stuff," concedes Myron Rolle, a Rhodes Scholar who was drafted in 2010 by the Tennessee Titans. Rolle credits the NFL's Rookie Symposium, a two-and-a-half day event at the end of June, and the Titans' player development director for helping him think wisely about money. "The best advice I got was to remain humble," says Rolle, who left the NFL and is now in medical school. "There are veterans on the team who have six or seven cars they drive to practice and Louis Vuitton and Prada suits. If you give into that lifestyle, you go broke quickly." Kelly tries to start all the Seahawks players off right and get them to make a budget. Most don't even realize that NFL players get paid throughout the season -- a bit after each game -- in the same way most people are paid weekly or bi-weekly. If you get hurt or cut, it could impact pay. "A lot of times, offensive and defensive linemen, those guys are more reserved [with money]," says Kelly. "The defensive backs and receivers ... how they are on the field is how they are off the field, and they spend accordingly." In addition to spending, there are also those oft-forgotten taxes and agent fees. "The biggest piece of advice I got -- the best -- was to understand taxes," George says. "I think I'm getting paid a $2 million signing bonus, but I'm not actually going to have $2 million after taxes, agent and marketing fees and so forth." Clowney and other top draft picks stand to make millions. But most rookies make the league minimum, which is $420,000 this year. It goes up every year that players stay in the NFL. So some veterans will make as much as $800,000. "It's a lot of money, but when I talk to guys, I often say, you're only as wealthy as your lifestyle," says Patrick Kerney, a former player who is now the NFL's Vice President of Player Benefits and Legends Operations. Kerney was notorious for driving an old Ford Bronco as a player. He says he got a reality check on money by watching how his good friends from his University of Virginia days who were not football players lived after graduation. One of the biggest challenges young players face is dealing with friends and family who want a piece of the action. "Friends think you must have millions of dollars, but you really don't have that unless you're a first round pick. And there's no guarantee you'll be in the league more than a year or two," says Chris Kluwe, who played eight seasons as a punter for the Minnesota Vikings from 2005 to 2012. Players are frequently approached to invest in ventures ranging from barber shops to coffee plantations in Brazil. "Family members have these great ideas and business deals. It just comes out of the woodwork," George says. "I don't like to shoot down dreams, but you have to be stern and wise and be able to say no." Even financial advisers can be suspect. Sports agent Leigh Steinberg says financial advisers often go to college campuses trying to sign student-athletes before they have agents. Some even try to convince players to sign power of attorney rights over to the adviser so they can sign checks and execute deals in a player's name -- without consulting the player. "Never give away power of attorney over to anyone. Run away once they talk about that," George warns. Even if players are making millions, few wind up playing for more than about a decade in the NFL. And that's to say nothing of the concussion crisis going on in football, notes Steinberg. The key is to make as many business contacts while they are still playing. "Once you're an ex-NFL player a lot of those doors are no longer open. It's about who did you meet when you were a football player," says Kluwe. The NFL even runs short courses at the business schools like Harvard and Stanford. This year, players can attend one at Notre Dame where they can network with professors and corporate leaders. Kerney challenged Darryl Tapp, a defensive end for the Detroit Lions, to attend one of the business school seminars last year. "I told him if you go and leave and you don't think it's worth your time, I'll buy your plane ticket," Kerney says. Tapp did attend -- and he didn't charge Kerney for the flight. Even though a majority of former NFL players have struggled financially once their gridiron careers are over, several players have left the NFL and become successful businessmen. DeRon Cherry, a former Kansas City chiefs safety, is a managing partner of a local Anheuser-Busch distributor. Brent Jones, a former San Francisco 49ers standout, founded a hedge fund of funds. And Hall of Fame defensive end Bruce Smith has become a real estate developer in Washington D.C. and Virginia. Former players who have managed their money well hope there will be more post-football victories like this.